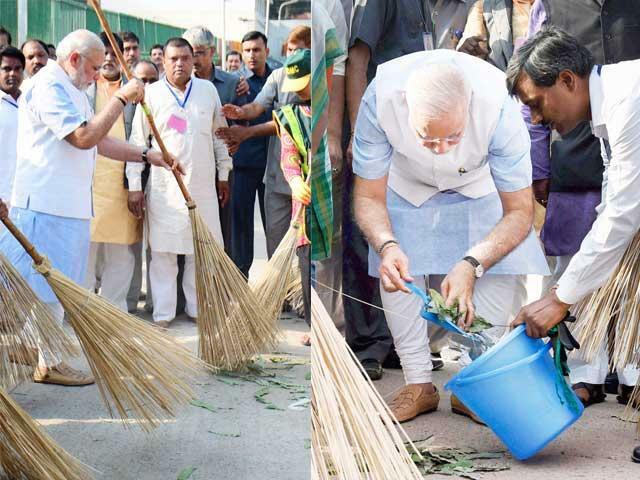 On 2nd October’2014 Modi launched a new mission as “Swachh Bharat Abhiyaan”. He launched it as a tribute to Mahatma Gandhi on the auspicious occasion of his birthday. He came from U.S. trip and launched this Campaign. Modi started this campaign from Rajpath, Delhi. Nitin Gadkari, Venkaiah Naidu were sharing the stage with Modi. Later on Film Actor Aamir Khan also joined Modi on the stage. Modi gave oath to all the people present there and told that “I will not make the environment unclean and not let any other people do the same.” Aamir Khan also took oath and told that if I would be invited than I would also like to join it. Shashi Tharoor – Politician (Congress). Baba Ramdev – Yog guru. Mridula Sinha – Governor of Goa. These 9 people have to also invite another 9 people and so on. Modi said it would not be successful without you people. If you start these now it would complete within 5 years. Government announced to give 20 lakh rupees to 6.5 lakh villages every year till 2019 to complete the mission of “Clean India Campaign”. Modi started cleaning the road of New Delhi streets. Most of the people to whom wager was given have accepted and told that accepting the wager would be a honor for me and they would help making Clean India. Hope so this campaign proves successful for not only as the political view but also as the personal as it is the main requirement to make India Clean.